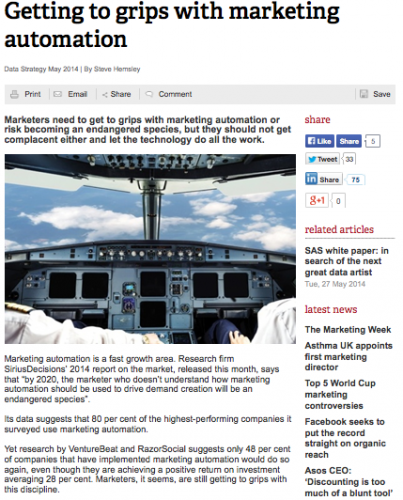 Marketing automation is a fast growth area. Research firm SiriusDecisions’ 2014 report on the market, released this month, says that “by 2020, the marketer who doesn’t understand how marketing automation should be used to drive demand creation will be an endangered species”. Its data suggests that 80 per cent of the highest-performing companies it surveyed use marketing automation. Yet research by VentureBeat and RazorSocial suggests only 48 per cent of companies that have implemented marketing automation would do so again, even though they are achieving a positive return on investment averaging 28 per cent. Marketers, it seems, are still getting to grips with this discipline. It will be of little comfort to any marketer stuck behind one of its member’s vehicles this summer, but the 107-year old Caravan Club is in marketing automation’s fast lane. The club has 375,000 active members and attracts up to 50,000 new supporters every year, and marketing automation in the form of its ‘nurturing programme’ is the society’s new secret weapon for engaging its latest recruits. The nurturing programme ensures new members receive a personalised welcome pack in week one, a note to research some of the Club’s 200 sites in week three and an introduction to core products in week four. Reminders to try different services are sent at strategic points over the next few months, and in month 10 new members receives a customer care phone call. “A decade ago, blanket direct mail was seen as junk and dismissed by consumers. Today, email can have the same effect if it is not relevant. Automation helps us to send time-appropriate messages and offers to the right people at the right time,” says Lewis. The Caravan Club’s marketing automation is a collaboration of data analysis tools, combining FastStats and Pure360 software. Lewis says technology helps brands with small marketing teams. He manages three marketers and between them they send up to 17 million emails and 4 million items of direct mail each year.